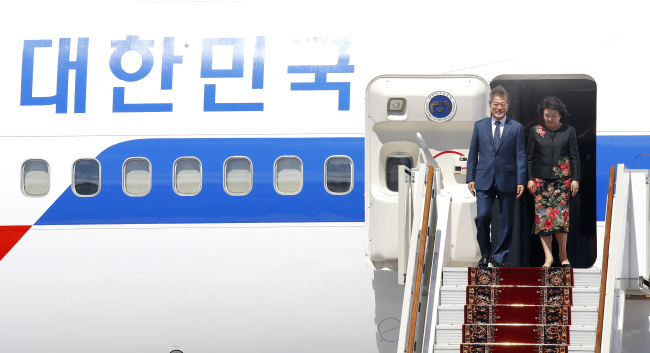 South Korea's defense ministry has recommended the presidential office lease a new plane for presidential overseas trips, an official said Thursday. Cheong Wa Dae has used a modified Boeing 747-400 airliner leased from Korean Air under a 2014 deal worth 142.1 billion won ($127.2 million). The five-year contract is to expire in March 2020. "(We) made a suggestion to the National Security Office and the Presidential Security Service that (Cheong Wa Dae) replace the aged jet with a new one," the ministry official said. The current 200-seat VIP jet was produced in 2001. Purchasing a plane can be another option, but the budget is a problem. "Cheong Wa Dae has not made any decision yet," the official added.